Every year at Christmas dinner, my husband toasts our guests with a small antique goblet. His gesture has become a new family tradition. Before he came across this goblet in our kitchen cupboard, it had sat unused at my parents’ Montreal home for decades. I had no idea what it was or how it came into the family. 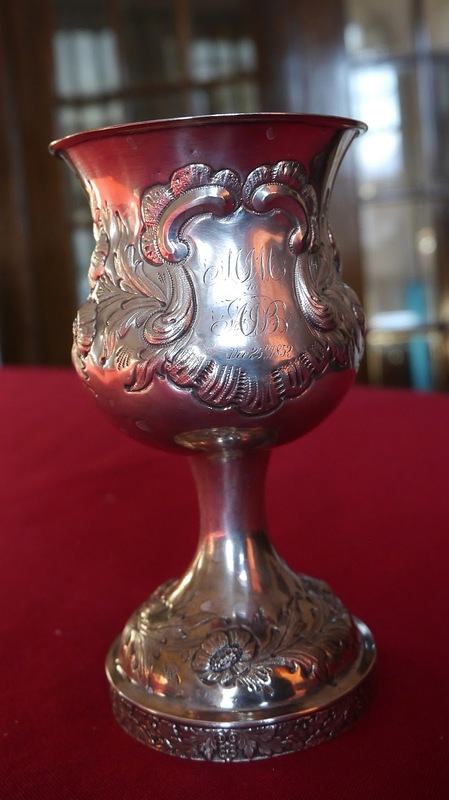 A pattern of flowers and leaves encircles the metal goblet and the initials and date “MJM to AJB Dec. 25 1852” are inscribed. I realized it must have originally been a Christmas gift, but from whom and to whom? Research revealed that MJM was MacGregor Joseph Mitcheson (1828-1886), and AJB was his 10-month-old niece Amelia Josephine Bagg (1852-1943). This must have been a gift MacGregor sent Amelia for her first Christmas. A fancy goblet seems like a rather strange present for a young man to give a baby, so perhaps it was a tradition, or his parents’ idea. Amelia was the second surviving daughter of Montreal notary and landowner Stanley Clark Bagg (1820-1873) and his wife, Catharine Mitcheson Bagg (1822-1914). Catharine’s family lived in Philadelphia and McGregor J. Mitcheson was the youngest of her three brothers. In 1852, he was age 24 and a law graduate of the University of Pennsylvania who had recently been admitted to the bar of Philadelphia. Despite the distance between the two cities, Catherine Mitcheson Bagg and her brother seem to have been quite close, so perhaps McGregor and Amelia eventually got to know each other. Amelia was 21 when her father died in 1873, and McGregor was one of the executors of Stanley Clark Bagg’s will, so he may have travelled to Montreal to advise his sister on family matters. MacGregor married at age 41 to Ellen Brander Alexander Bond, a widow, and together they had three children. One died as a child, one did not marry and one married but had no children. As for MacGregor’s niece Amelia, she also married relatively late at life. She married her first husband, real estate agent Joseph Mulholland, in 1890 and he died seven years later. Her second husband, Rev. John George Norton, Anglican Archdeacon and Rector of Montreal., was a widower. Amelia had no children of her own, but she was quite close to her niece Gwendolyn Bagg (1887-1963) and Gwen’s husband, Fred Murray Smith -- my future grandparents. They probably inherited the goblet when Aunt Amelia died, age 86, in 1938. For them, it would have been a precious reminder of a favourite aunt and a link to a great-uncle who died the year before Gwen was born. 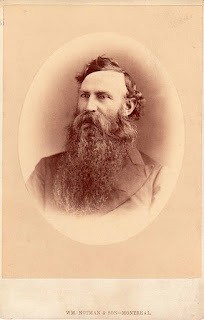 Photo of MacGregor J. Mitcheson by Wm. Notman & Son, Montreal; Bagg family collection. I have described the goblet as metal because I do not know whether it is silver or pewter. There is no hallmark on it. MacGregor J. Mitcheson was born Joseph MacGregor Mitcheson on Nov. 26, 1828 and died at age 57 on June 29, 1886. These dates are according to the cemetery records of St. James the Less Episcopal Church, Philadelphia. The records of St. John’s Protestant Episcopal Church, Northern Liberties, Philadelphia, held at the Historical Society of Pennsylvania in Philadelphia, say he was baptized on April 17, 1829. 1. “U.S. Passport Applications, 1795-1925,” Ancestry.ca [database on-line] entry for MacGregor J. Mitcheson, 1865; National Archives and Records Administration, Washington DC. ARC Identifier 56612/MLR Number A1 508, NARA Series M1372; Roll # 127. 2. Robert D. Coxe, Legal Philadelphia: Comments and Memories, Philadelphia: W.J. Campbell, 1908, p. 140, accessed March 3, 2013. 3. An Historical Catalogue of the St. Andrews Society of Philadelphia with Biographical Sketches of Deceased Members, 1749-1907, printed for the Society, 1907; Google Books, accessed July 19, 2013. It was the end of April in County Kilkenny. Trees were turning a delicate green, lambs rested beside their mothers in the shadow of an old monastery and cows grazed beside an ancient Celtic cross. I was on a pilgrimage to this corner of southeast Ireland to visit the haunts of ancestors who had left here almost 175 years ago, and I was wondering whether this landscape had been as beautiful during their lifetimes. 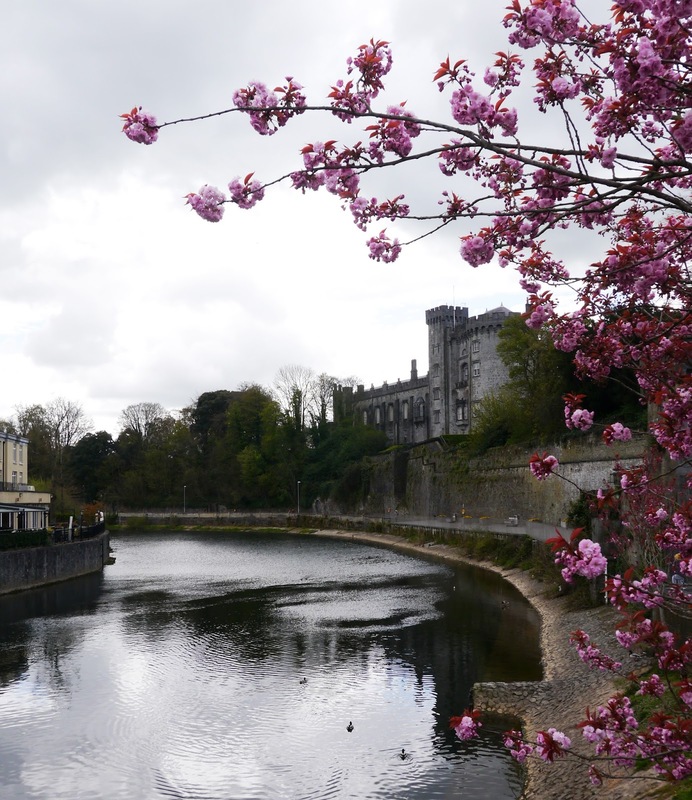 Seven generations of the Shearman family lived in the Kilkenny and neighbouring Waterford regions between the middle of the 17th century and the mid-19th century, when my great-great grandmother Martha Bagnall Shearman left for Canada. 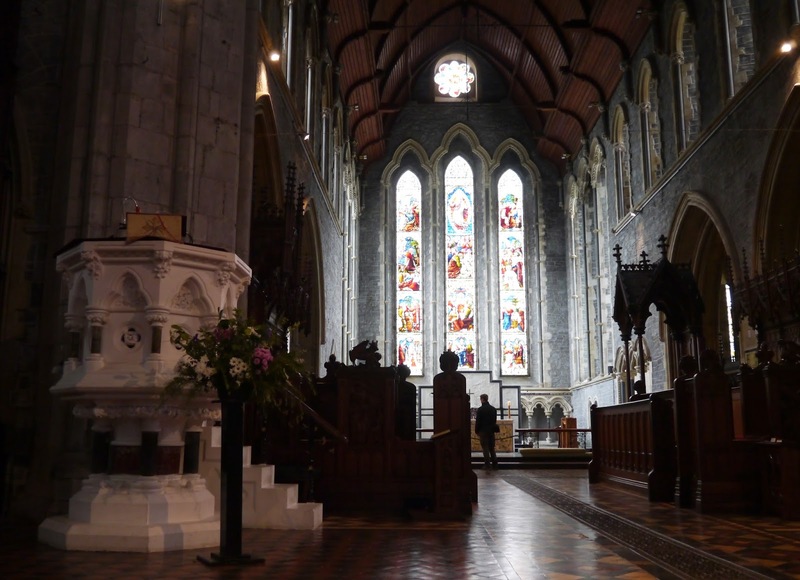 Around 1853, John Francis Shearman (I will refer to him as JFS), a Catholic priest and amateur archaeologist, wrote a history of the Shearman family, a document preserved in the archives of National University of Ireland at Maynooth. Family members were also mentioned in newspaper articles and land records. From those small facts, I formed imaginary snapshots of my ancestors and planned an itinerary for a trip to the part of the world where they had lived. 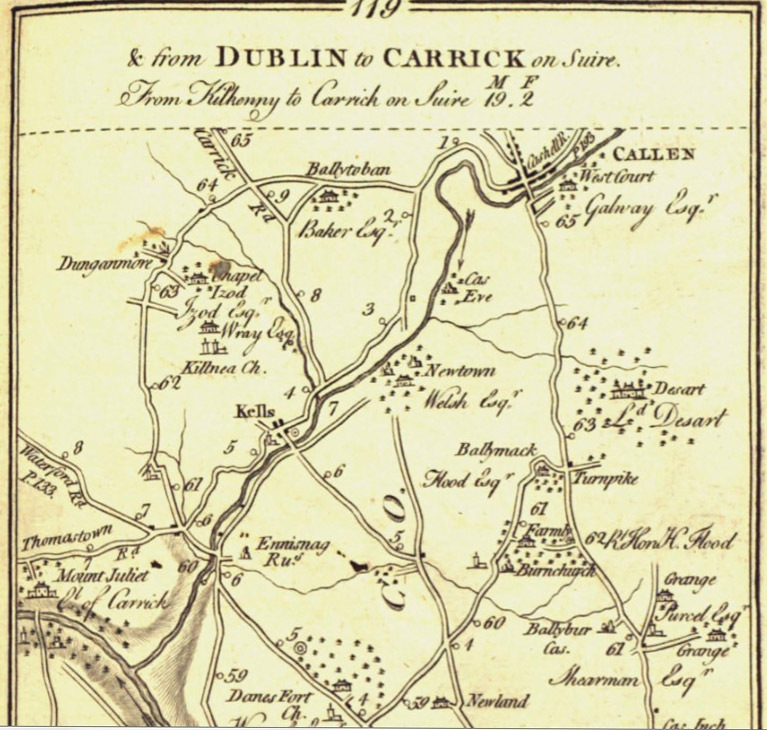 The Shearman family was long associated with Grange, a townland and parish in County Kilkenny. According to JFS, Robert Shearman bought property there in 1697. Almost a century later, in 1780, another Robert Shearman constructed Grange House, but all I could find in the neighbourhood where the house once stood was a narrow lane surrounded by low hedges. Edward Law, who researched Kilkenny houses, noted that, in 1767, Robert Shearman (it is not clear which one) found a new method of planting potatoes early in the season.1 Reading that, I imagined Robert in the garden, shovel in hand, bent over the potato plants. According to JFS, Thomas was buried in Burnchurch in 1704. I hoped to find his grave, but instead found the church in ruins. Thomas and his wife (name unknown) probably had four children, including my direct ancestor Robert Shearman. Robert was born about 1636, possibly in Burnchurch, possibly in England, and died in 1732. Robert married Mary Boulton in 1665. JFS gave no more details about them except that they had six children. Robert’s and Mary’s second son, Francis Shearman, born in 1669 in Grange, apparently enjoyed “rude health.” Even at an advanced age, JFS reported that Francis was able to crack a mouthful of hazelnuts. He died at age 105, following an accident received from his horse. Francis married Anne Davis in 1701. Anne became a Catholic “from the effects of a dream.” According to JFS, her husband and her son Robert inflicted “heartless persecution on her” because of her religious conversion. Catholics were treated as second-class citizens at that time. Anne died at age 90 in 1767 and was buried in Cuffesgrange (Catholic) Church Cemetery. It is not clear whether her husband is buried with her. Francis and Anne had eight children. My line goes through the second oldest, Robert, born around 1704. He eventually became an alderman of the city of Kilkenny and also served as mayor. I imagined Robert striding past Kilkenny Castle, overlooking the River Nore, on his way to meet a friend on High Street. JFS wrote that Robert had “a stern and hasty temperament” adding that his wife’s personality was the opposite. Robert Shearman married Frances (or Fanny) Waye in 1740. 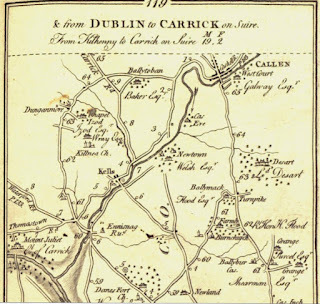 The daughter of Thomas Waye and probably of his second wife, Frances Cuffe, Fanny was born around 1714 in Kilree, County Kilkenny. 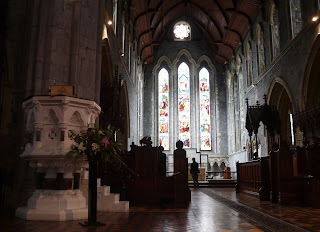 Her father, Reverend Thomas Waye (1644-1716), was treasurer and administrator of St. Canice’s (Church of Ireland) Cathedral in the town of Kilkenny. During my visit to this medieval church, I admired its soaring stained glass windows and imagined Reverend Waye at prayer in a quiet corner. My line of the family was through Robert’s and Fanny’s fourth child, Thomas, who was born around 1754. At age 25, Thomas married Martha Emerson at Waterford’s French Church, an ancient Franciscan friary. It is listed as a national monument of Ireland, but only the shell of the building remains and it was hard to imagine a wedding being celebrated there. Thomas and Martha had three children: William, a lawyer who lived in Greenville and married Hannah Mammett; Thomas, of Waterford, and Fanny, who married Richard Curtis. Thomas married Charlotte Bennett Clarke, the daughter of Waterford pewter manufacturer Charles Clarke and his wife, Miss Bennett of Bath, England. Thomas and Charlotte had 13 children. By the time Thomas died, his daughter Martha Bagnall Shearman (1826-1897) had married Charles Francis Smithers and they were living in Canada. Two of his sons and a daughter were in Brooklyn, New York and son Robert Clarke Shearman was in Australia. Ireland was a troubled place for centuries, treated as a rebellious colony by the English government. In the 1840s, the potato crop failed and thousands of desperately poor peasants either died or fled. Although the Shearmans appear to have been relatively well off, they must have felt that their families would have better opportunities elsewhere. I doubt that the Ireland of 1850 resembled the idyllic-looking countryside of today. This article relies extensively on a copy of a copy of John Francis Shearman’s research. My distant cousin Lorraine Elliott took notes on the JFS’s family history and did additional research. She generously shared her notes with me. JFS had access to parish records and family anecdotes that no longer exist, but there are many details that remain unknown and it is likely that there are errors in this article. Another version of the Shearman family history can be found on www.familysearch.org. “Genealogy of the Shearmans” was prepared by George Shearman of Penn Yan, New York in 1863, and it is clearly based on the document JFS wrote a decade earlier. 1. Edward Law, Kilkenny History; Miscellaneous Houses, homepage.eircom.net/~/lawekk/HSESG.HTM, accessed Dec. 12, 2017. 2. Email correspondence with the Kilkenny Archaeological Society, Rothe House, Kilkenny, March 30, 2016. 4. “Death”. Waterford Chronicle, Dec. 28, 1850. www.findmypast.com, Irish Newspapers, accessed April 8, 2016.